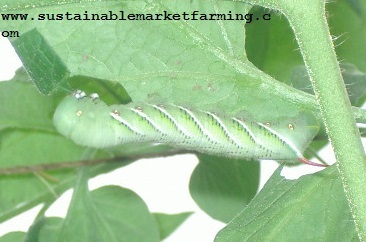 Hornworm on a tomato plant. 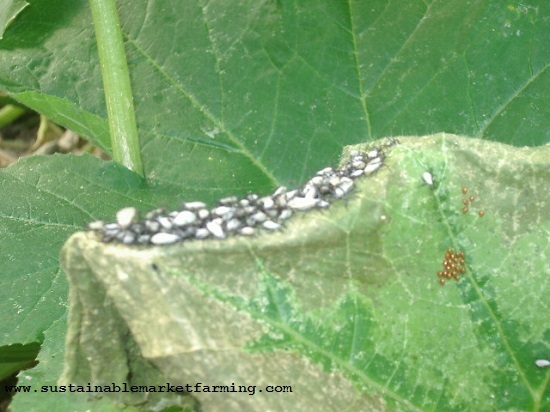 It’s August, which for us is the peak time for pest insects as well as for fungal diseases. This year, we have been collecting Japanese beetles from our okra plants, to prevent the leaves getting stripped off. It seems to be working. Many plants can take 30% defoliation without a loss of yield, but some years, our okra plants end up as just a bunch of stalks, and you know that means almost no photosynthesis can happen. Japanese beetles are one of the insects that have an aggregation pheromone, so those commercial traps are not only gathering up your own Japanese beetles, but also attracting neighbors’ beetles. Sometimes this means no net improvement, as the newcomers eat crops before going into the trap. Another bad summer pest here is the Harlequin bug, a brightly colored stink bug. We try to have July be “No Visible Brassicas Month” aiming to disrupt their lifecycle. 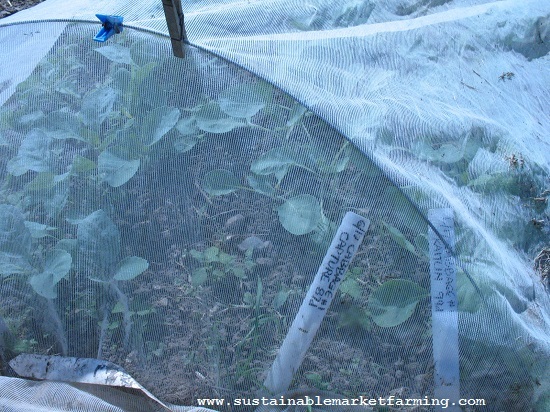 We use insect netting over the fall brassica seedlings we sow in June, and we clear our spring brassicas before the end of June. 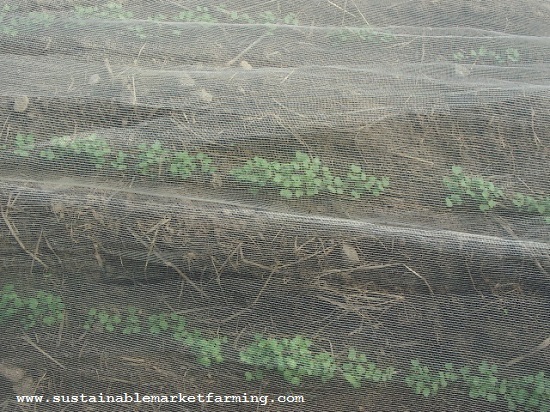 In July and July we use netting over any new brassica transplants, and sowings of turnips. During August we remove netting from older transplants and sowings, on to newer ones, such as kale and collards. 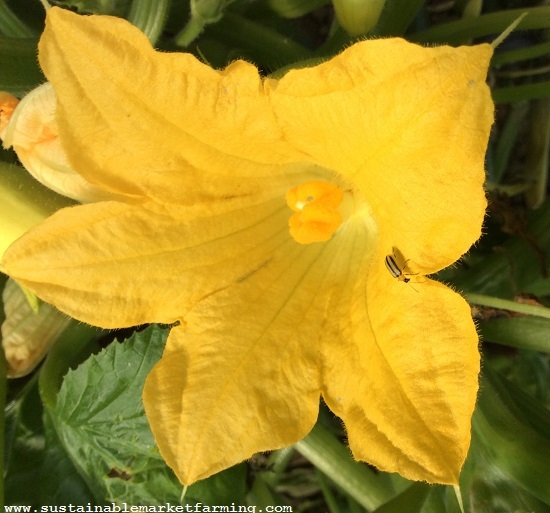 I wrote about squash bugs and cucumber beetles on our hoophouse squash in June. 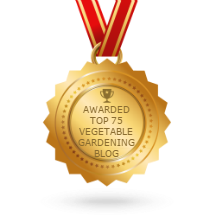 Margaret Roach at A Way to Garden has a good post on distinguishing between the tobacco and the tomato hornworm. 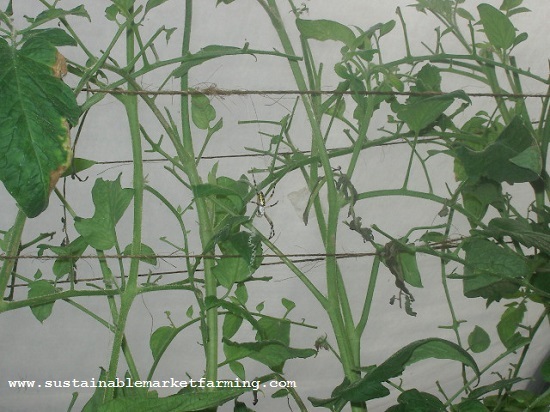 Both species eat Solanaceous crops (nightshades) such as tobacco, tomato, peppers, eggplant and potatoes. The differences are in the stripes and the horns. 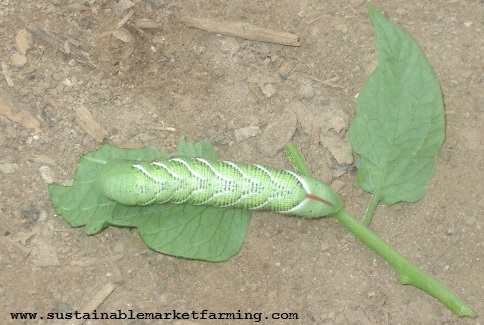 We have tobacco hornworms (this land was a tobacco farm before Twin Oaks bought it 51 years ago. This year, for the first time, we haven’t had any hornworms in the hoophouse. We’ve pulled up our tomato plants in there – we only grow the earlies in there, as it’s plenty warm enough to grow tomatoes outdoors here from May to October. I might be celebrating too soon – we still have a bed of peppers in the hoophouse and I think I might have seen evidence of a hornworm at work, although I could not find the culprit yesterday. We’re always a bit anxious that TSWV might show up one day, but luckily it hasn’t. Meanwhile we forget what it looks like. Here’s a few photos on the Cornell Vegetable MD Online site. 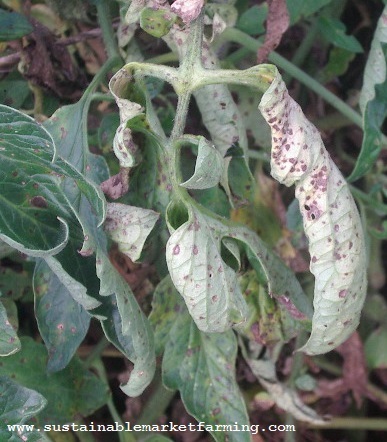 And here’s a good collection of tomato disease photos on the You Should grow site. Spotty tomato leaves. I think this is Septoria Leaf Spot. Hornworm mother Hawk Moth trapped by a zipper spider. We sow our fall broccoli and cabbage in mid-late June, followed by our outdoor Asian greens and collards. These will all get transplanted from nursery seedbeds covered with insect netting, to growing beds covered with insect netting. 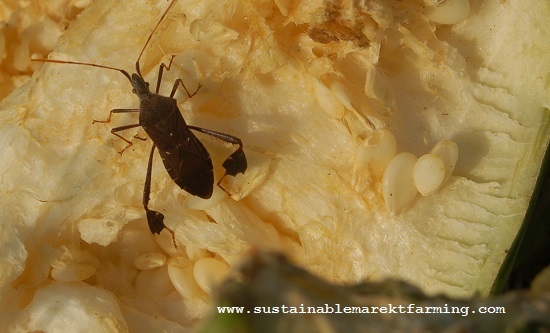 In the summer we try to have a No Visible Brassicas Month to break the lifecycle of the harlequin bugs. 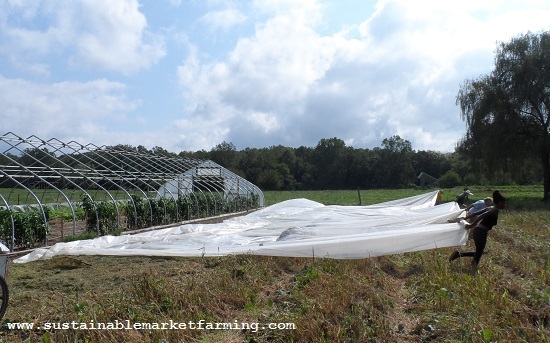 Once our spring kale is finished, the spring cabbage gathered in and the spring broccoli mowed down, the only brassicas are hidden under netting. Our hope is to starve out the harlequin bugs or at least deter them from making too many more. This year we have a simplified plan: one broccoli variety, one cabbage variety, Morris Heading collards, Koji (a hybrid Asian green a bit like Yukina Savoy) and Senposai. The broccoli is an OP variety, Umpqua. It takes 96 days to maturity, has dark green 5-6″ heads and makes lots of side shoots. That’s a long wait compared to 54d Tendergreen and 60d Green Magic, so I hope it’s good! It’s certainly highly rated compared to other OP types. The cabbage is Storage #4 a 4-8 lb 90-95d hybrid, for fresh use and storage. 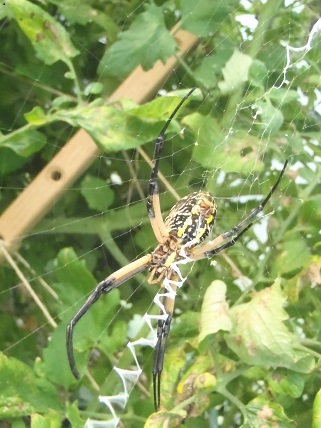 Zipper spider catching pest bugs on our hoophouse squash. 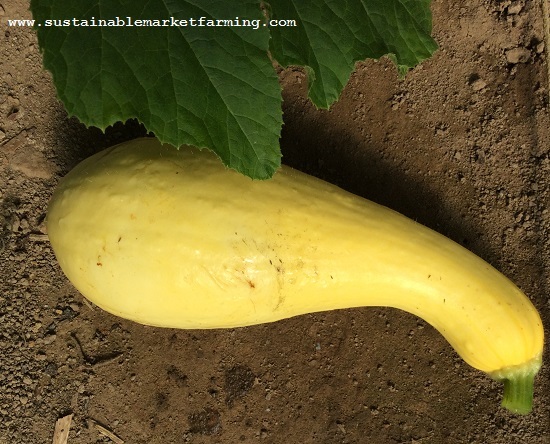 After worrying about the challenges with our early squash in the hoophouse, I realized today that at least half of the plants are still producing, while the younger first outdoor planting has given up, before the second planting is ready to take over. 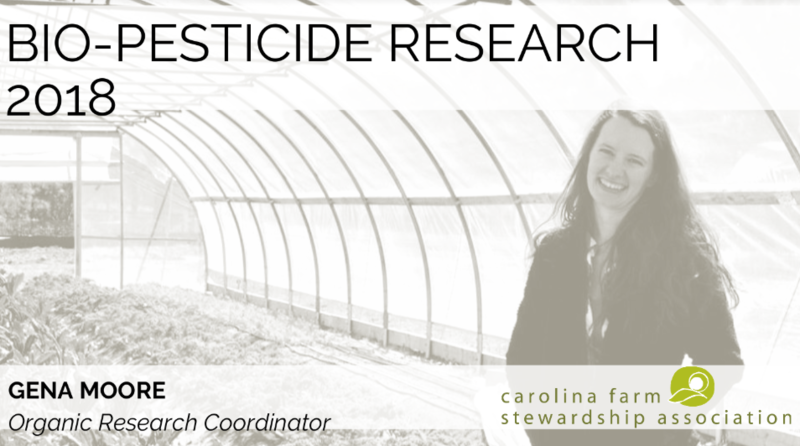 An interesting blog post cones from the Carolina Farm Stewardship Association, exploring the meanings of “organic”, and I will summarize it here. Paying the higher price for organic products is always a personal decision, and whether buying USDA Organic food is “worth it” depends on the relative value that the consumer puts on food The Real Organic Projectbeing produced in accordance with USDA Organic standards. Formally: When used to advertise and sell a farm product, the word “organic” is regulated by federal law—the Organic Foods Production Act (OFPA) and the related USDA Organic regulations. This legal meaning of the word “organic” as defined by Congress and the USDA has only been around since 1990 (when OFPA was signed into law). USDA Organic standards are the same from state to state and from store to store. Because the USDA tracks the sales of certified Organic products, buying USDA Organic food is a great way to vote with your dollar. The core principles of organic agriculture were initially developed by organic farmers, not the USDA. Informally: In daily life, many people use the word “organic” for agricultural products that were grown using methods that are similar to or even completely consistent with the USDA Organic standards but are grown by uncertified farms. 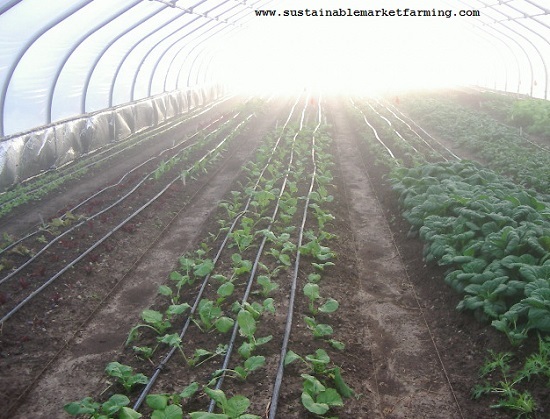 The cultural practice of farming using organic methods has been around for a at least a hundred years. 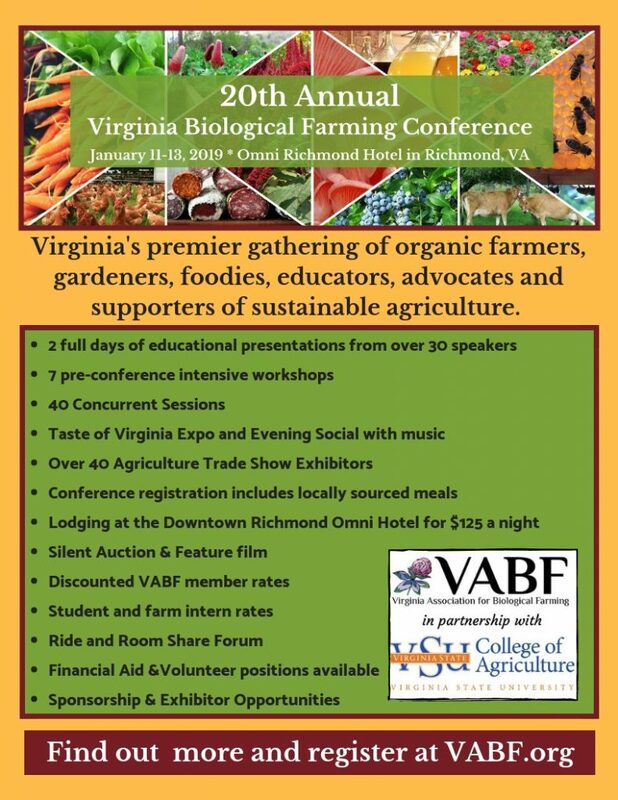 Many outstanding organic farmers were growing organically before 1990 and either have never bothered to become USDA certified Organic or have given up their certification since then. However, after 1990, they could no longer market their products as organic. 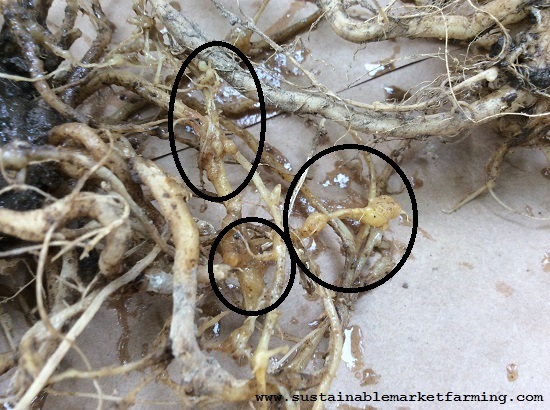 Permaculture questioned, Growing for Market, Mother Earth News blogpost, Longhorn tick. I’ve long had some misgivings about the almost religious fervor of some permaculturists, while at the same time appreciating their seriousness about sustainable land use. (In fact I have written for Permaculture North America, and I have friends who are Permaculturists.) My first impressions of Permaculture were that it was a combination of common sense farming practices gussied up with new labels, other ideas that seemed to me very impractical, and ideas that might work fine in the tropics but not so well in the rest of the world. But it seemed rude to say so publicly. Like picking a fight with allies when there are so many more important campaigns. And more recently I have met some gardeners and even farmers who apply the Permaculture ideas that work in their context, without becoming evangelical about it. 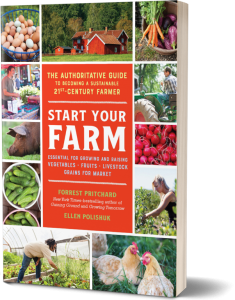 I would love to read a practical book written by someone farming commercially, explaining how they apply some of the Permaculture ideas, and make a living. 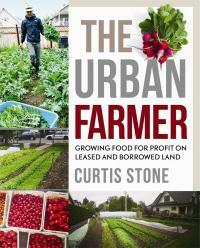 Curtis Stone (author of The Urban Farmer) has given all this consideration and has written an interesting, thoughtful article in his blog From the Field Friday. Curtis describes how many people new to farming are a bit starry-eyed, and are (as he was) inspired by Permaculture ideas. 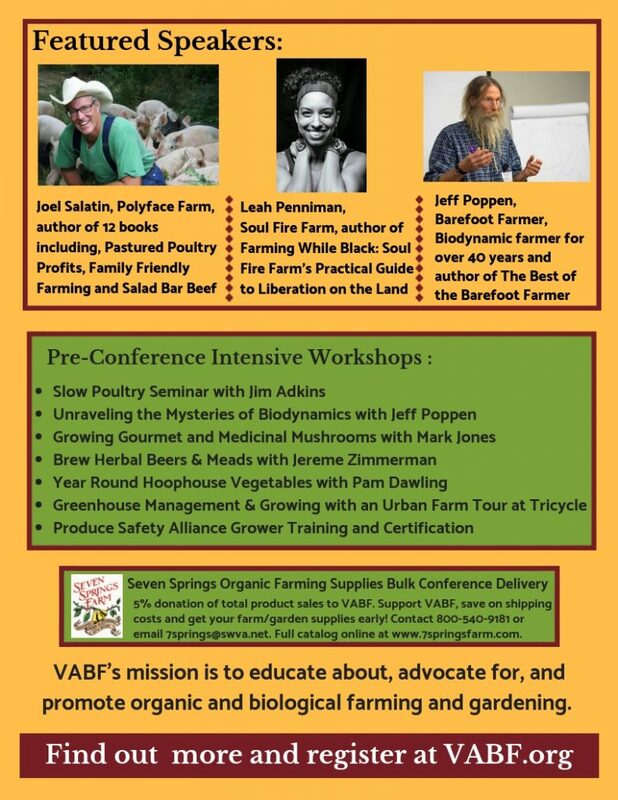 In his experience, many of the promises of Permaculture don’t pan out, especially if you try to make them work on a commercial scale as opposed to a hobby, when it doesn’t matter how long a method takes, or how much money it costs. He has identified five slogans of Permaculture he believes should disappear. He wants to save farmers from burning out while holding these unrealistic tenets. At the same time, he is not disrespecting any individual Permaculture teachers or students, authors or farmers. He just wants everyone to have realistic expectations and for commercial growers to use viable methods. 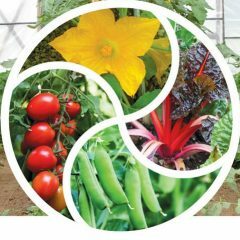 Permaculture aims to keep the topsoil in place, along with all its biodiversity, and grow food, following patterns in nature. This is a great approach. The problems come with some of the specific prescriptions. Curtis Stone labels five problematic cultural memes The Self-Sustaining Farm; The Lazy Gardener; Mulch Everything; Swale Everything; and No Pests! The Forest Garden can work for someone with enough land, providing food for just a few people. There are fruits and nuts, some perennial vegetables, and annual vegetables between the trees. But in order for a food system to feed lots of people, we invented agriculture (which is not natural) to dependably produce quantities of food in an efficient (affordable) way. Most vegetables are annuals, not perennials, and that where the work is, and the bulk of our food. A lot of food can be produced efficiently from a relatively small area of land using annual crops. A Forest Garden is not going to feed the world, and it’s unfair to new farmers to tell them it will. It’s also untrue to suggest that forest, orchard and vineyard crops require almost no work once they are established. 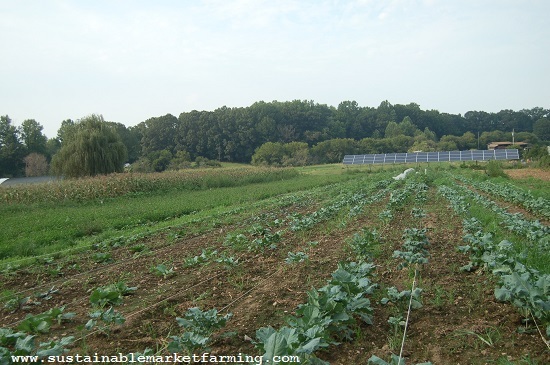 Growing food for lots of people is hard work, even when you apply smart methods. This idea comes from Bill Mollison, suggesting you can plant crops and ignore them, and get good harvests. Planting potatoes by covering them with mulch rather than soil is one suggestion. Most of these “Lazy Gardener” ideas are not workable on a commercial scale. You can ignore weeds and use “lazy” methods if you are not earning your living from farming, or expecting to feed many people. It’s a lifestyle choice, not a career. Swales are shallow ditches running along the contours, to catch and hold water – a lovely idea to conserve water resources. Constructing these on a farm scale is time-consuming. Navigating swales while growing rows or beds of annual crops is not very practical. Not all soils or all crops benefit from water retention. Curtis Stone claims he has heard of permaculture consultants putting in swales which led to too much water retention and then landslides! Nowadays Key-line plowing has made water-retention far more practical. But we shouldn’t all install water retention everywhere. The need will depend on the soil, the climate and the crop. This slogan I have also taken issue with, myself. It’s the mistaken belief that if you garden or farm well, you won’t have any pests. 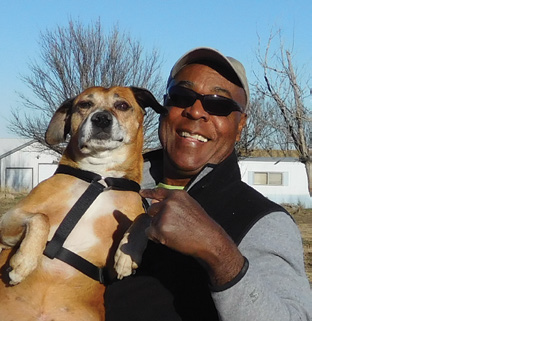 It’s a “Blame the Victim” thing – if you have pests, you must be doing something wrong. I’m all for planting flowers to attract beneficial insects, and encouraging bees, good bugs and birds. But pests and diseases do still happen to good people! It’s important to work to prevent and avoid pests and diseases – but still, keep on scouting! You can’t safely assume you won’t get pests. 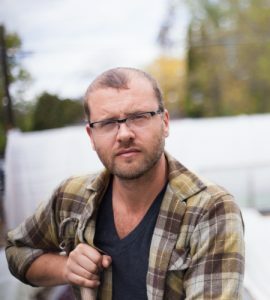 Curtis says that for him the oddest irony is the people in Permaculture who critique other farmers as if one problem is the root cause of all that goes wrong, while themselves believing that a particular permaculture idea applies always and everywhere, rather than being dependent on the wider context. This he calls “a monoculture of thinking”. Truly there is no one sustainable solution for all farming situations. It’s easier to have simple beliefs, but it doesn’t work. 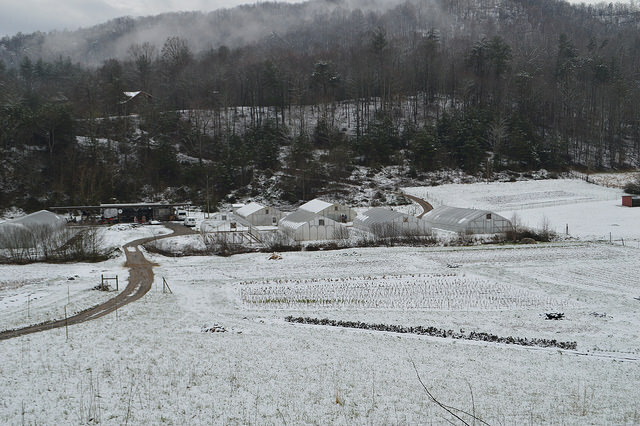 Every permaculture method is not going to work on every farm. We need to stay adaptable and flexible in our thinking, and respect and look for diversity in our approach. 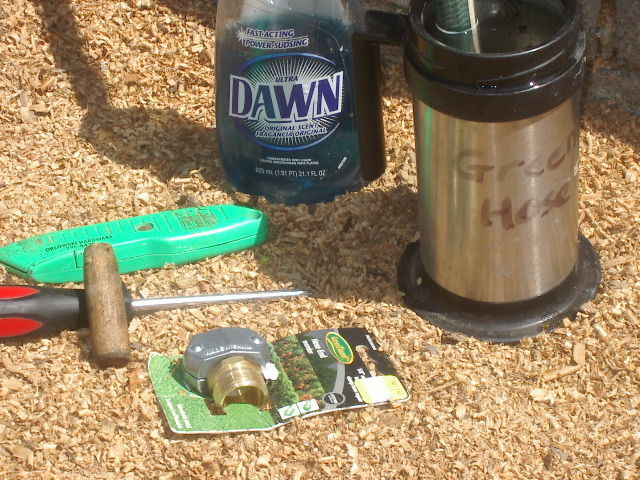 Her suggestions include reducing the number of different varieties, labelling all beds clearly, having clear standards and measurements, having only one kind of watering wand and timer, only a few sizes and types of harvest container, having clear places where information is written and stored, using checklists, so workers can be more independent. Jesse Frost writes about making effective use of social media to increase farm sales. You Tube and email might do better than Facebook. Paying to advertise on Facebook can be more effective than merely posting something. And remember that people want a personal connection, not a hard sell. 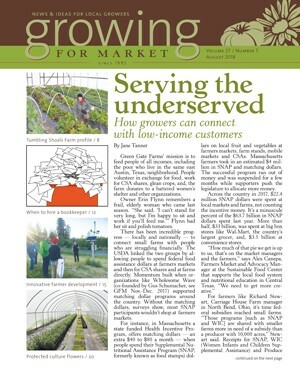 Jenny Quiner writes about her urban farmstand’s struggle with changing county regulations. This will be useful to anyone in a similar situation. Anne and Eric Nordell, well-known long-established horse-powered vegetable farmers from Pennsylvania, have been re-thinking plant spacings, after surveying seven other teamsters’ cropping methods. They compare the plant densities used by horse farmers with tow common tractor-farming spacings and two intensive bed densities. Food for thought. 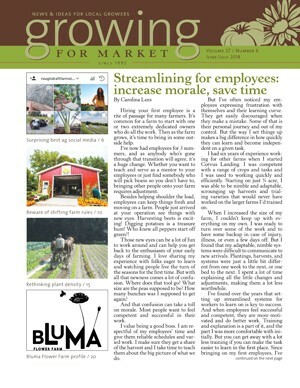 Ellen Polishuk has interviewed Joanna Letz of Bluma Flower Farm for this issue. A misty November morning in the hoophouse. 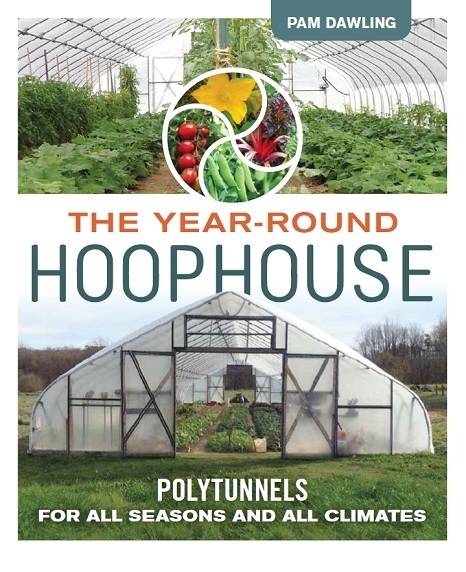 If you have been wondering whether a hoophouse (high tunnel) would be worthwhile, this list of twenty reasons to have one can help you decide. The benefits include more and better crops, extended seasons, food self-reliance and a very pleasant work environment. Don’t think of this as ending with bad news, think of it as saving your health. There is a new tick. The Longhorn Tick has now been found in West Virginia and Virginia, as well as New Jersey. The longhorn tick is small and difficult to detect. It is known to carry several diseases that can affect humans, as well as livestock, including some diseases that are not prevalent in the United States, but have affected people in Asia. 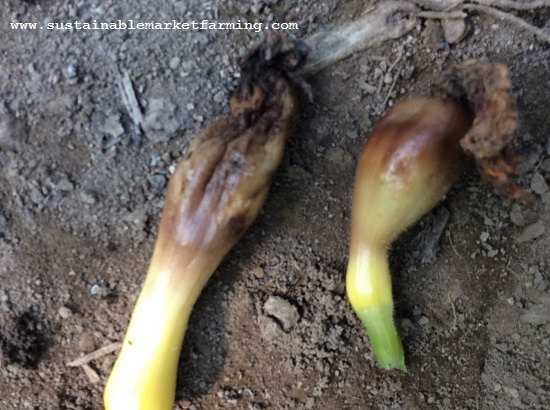 This species was first identified by the Animal and Plant Inspection Services of the U.S. Department of Agriculture in New Jersey in November 2017. The West Virginia State Department of Agriculture has confirmed the presence of the tick in West Virginia. The longhorn ticks were identified by samples collected from two separate farms in Hardy County WV, both of which are near the Virginia border. 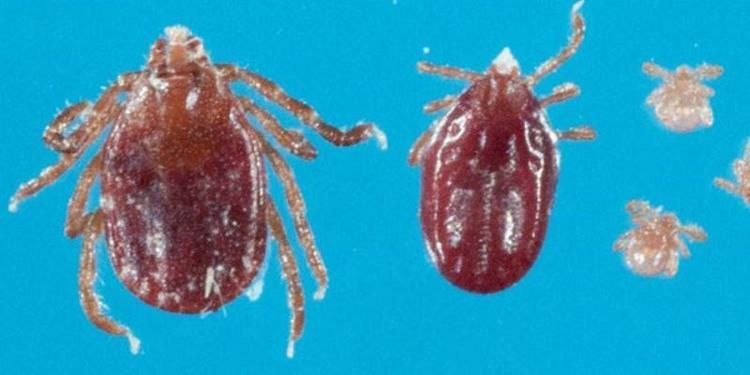 The Virginia Department of Agriculture and Consumer Services confirmed the presence of the tick in Warren County in northern Virginia (on horses), and in Albemarle County on a calf. A list of common ticks found in Virginia can be found here. 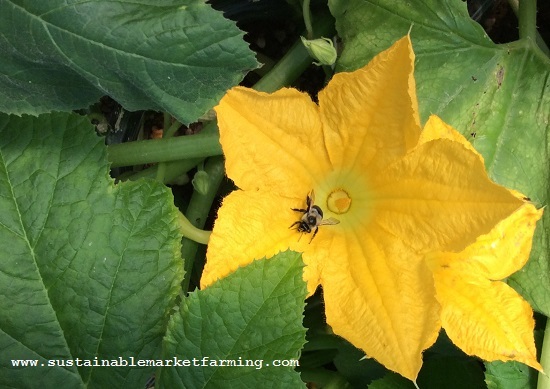 Author farmerpamPosted on June 19, 2018 Categories hoophouse, Pests, Sustainable vegetable productionTags 20 Benefits of Having a Hoophouse, Growing for Market magazine, longhorn tick, mother earth news, permaculture, plant density2 Comments on Permaculture questioned, Growing for Market, Mother Earth News blogpost, Longhorn tick. 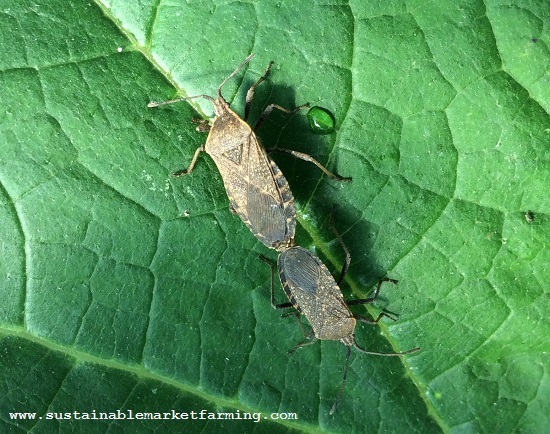 The season is warming up and insect pests are jumping into action. Here’s some old foes and some new ones to watch out for, and some friends too. 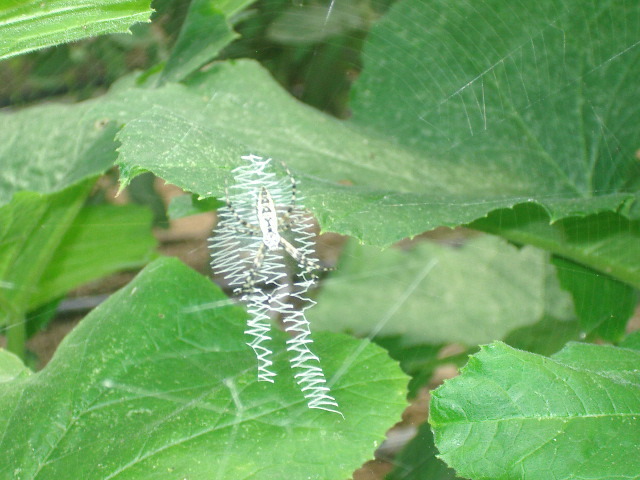 Gray garden slugs, Deroceras reticulatum, with chewing damage and slime trails on leaves. We have very few snails, and compared to some other places I’ve lived, few slugs. 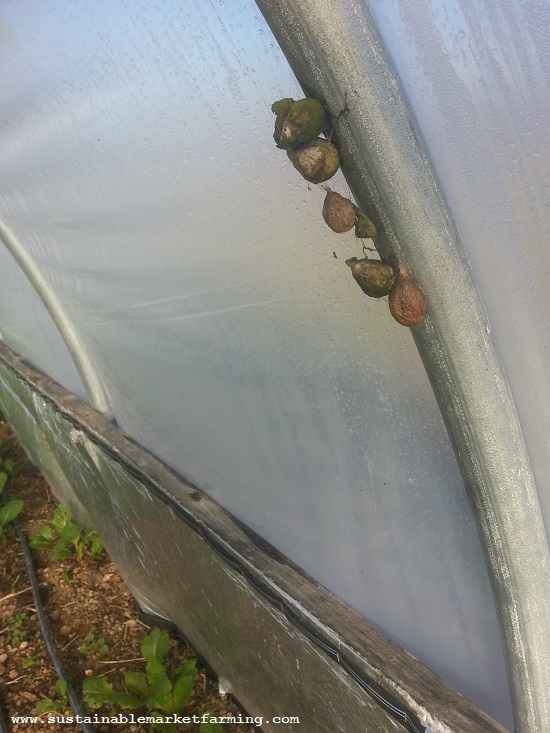 But the slugs we do have really like the hoophouse. I found two this morning on the cucumber plants. (It was an overcast morning – they don’t like high temperatures.) My reaction was to flip them onto the path and stomp on them. We rarely have to take stronger action. If we do, we sink shallow plastic dishes into the soil, with the rim at soil level and fill the dishes with a dilute version of beer or soda, or sugary water. I don’t know if it has to be fermenting to be attractive to slugs, but any sugary liquid in our hoophouse warmth is going to start fermenting after a day. If numbers are really high and damage is extensive, we need to hunt the slugs down. Do this at dusk or later, with a headlamp and either a pair of scissors or a bucket of soapy water. Another good resource is the UC IPM site which takes the IPM steps one at a time and applies them to slugs. 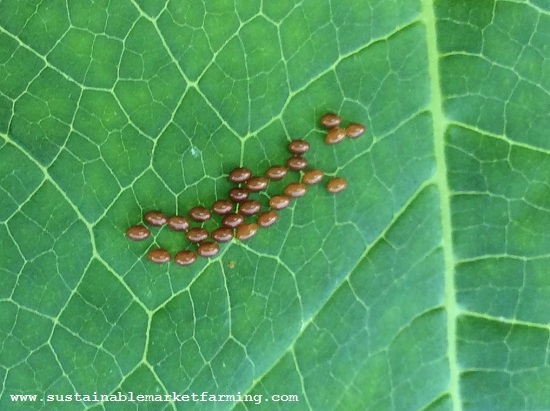 How to Manage Pests/ Pests in Gardens and Landscapes/ Snails and Slugs which has good photos. Grow Smart Grow Safe looks at many options. See their Table of Molluscicides. It explains all the current options. The Wisconsin Department of Natural Resources has good information, including photos. 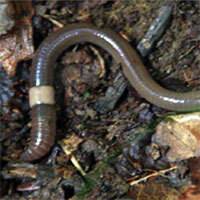 These worms eat up all the leaf litter under trees, causing desert-like conditions. 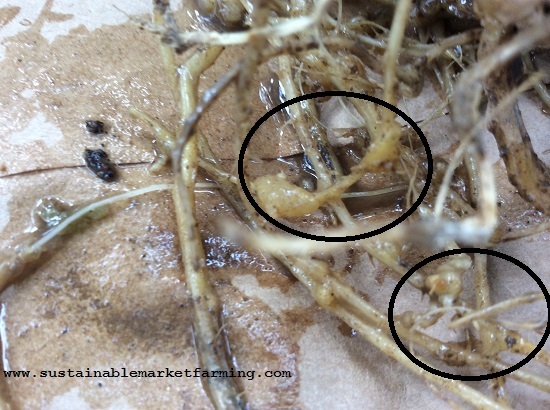 The surface soil becomes grainy, with a texture like dry coffee grounds, and no longer supports the growth of under-story plants.The 1.5″-8″ worms thrash around if picked up. Visually they can be distinguished from other earthworms with a clitellum (saddle), because theirs is cloudy white and smooth. 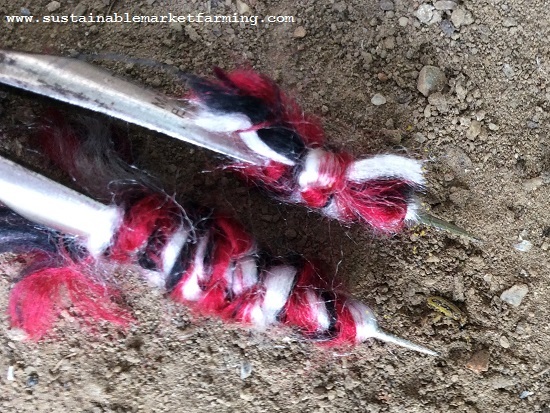 Use the jumping worm identification card [PDF] and brochure [PDF] and watch for this pest. Report finds to the DNR or your Extension Office. 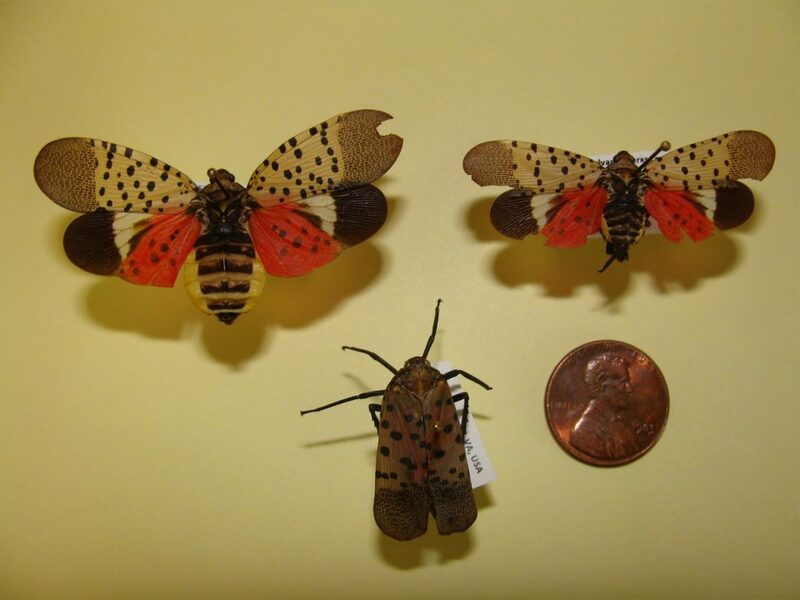 Another invasive alien is the Spotted Lanternfly, a pretty hopper. Lycorma delicatula (White), an invasive plant hopper, has been discovered in Berks County, Pennsylvania. 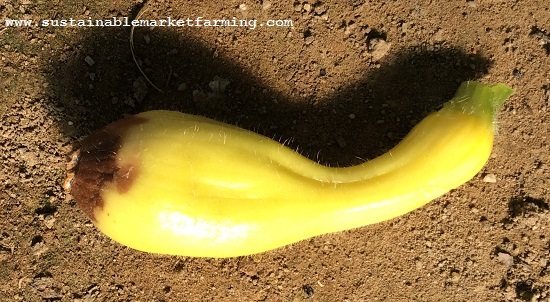 It is native to China, India, Vietnam, and introduced to Korea where it has become a major pest. As well as Eastern Pennsylvania, the pest has been found in Virginia, Maryland and New York. The red bands on the hind wings are not visible when the insect is at rest with the wings folded up over the back. It can easily blend in on tree bark. Note that the earlier stages of this pest look very different. The first nymphs are black and white, later ones, red, black and white. All stages are spotted. This insect has the potential to greatly impact almonds, apples, apricots, cherries, grapes, hops, nectarines, peaches, plums and walnuts, as well as these trees: maples, oaks, pines, poplars, sycamores and willows. If you find a spotted lanternfly, report it to your Extension Office. Click here to learn more from Pennsylvania Department of Agriculture, and here to read more from USDA APHIS. We mostly have good bugs. While working in the hoophouse this morning, harvesting scallions out of the way of advancing enlarging cucumber plants, I also found many tiny zipper spiders and their tiny webs. These will get impressively huge. 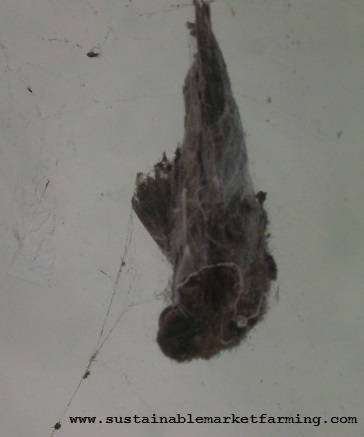 We made a point of saving their egg-cases on the bows of our hoophouse over the winter. Zipper spider egg cases overwintering in our hoophouse. I also saw a tiny praying mantis, another creature whose egg-cases we make a point of storing in the hoophouse over the winter. And I saw a tattered Monarch butterfly. 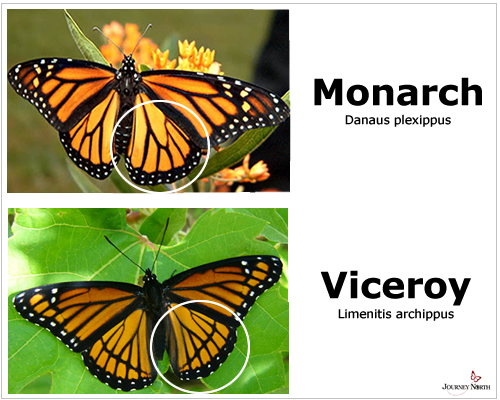 I had to check the Monarch or Viceroy? Page to be sure.